To strengthen Christian churches through fellowship and support by providing services that will help bring unity and edification to the body of Christ which is the head. To equip, motivate and empower churches in the areas of evangelism, education and in developing other ministries within church. The whole Church redeemed is Christ’s body in the universe. The church in any particular community is a body of Christ in the community. The word “church” means a congregation or assembly, and may apply to all believers in any one locality or to Apostolic times there were different worshipping bodies in certain localities. (Romans 16:5; I Corinthians 16:19). While men become members of the church of Christ by the new birth, yet as to its outward manifestation there must be some sort of organization. The exercise of church discipline necessitates the existence of a formally organized body. 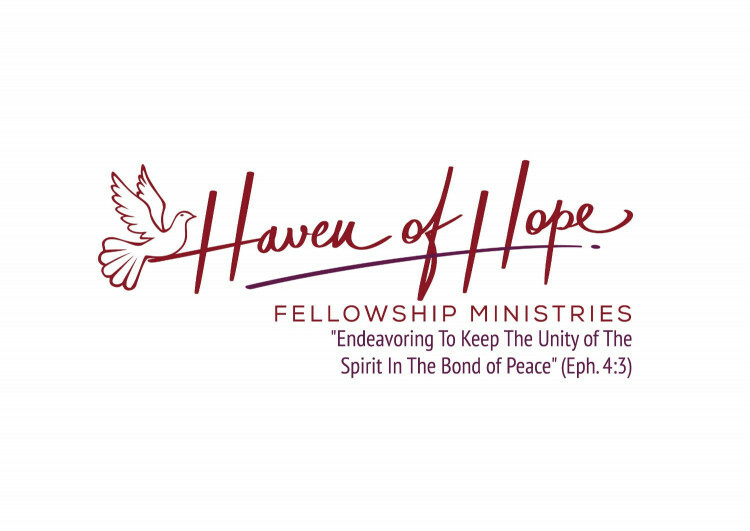 HAVEN OF HOPE FELLOWSHIP MINISTRIES Whereas, the Word of God addressed the entirety of man’s relationship to both God and man; and Whereas, the word of God places upon us the responsibility and accountability to God for direction and leadership; therefore, Haven of Hope Fellowship Ministries, Charleston WV acknowledges that this fellowship shall be the final authority in the interpretation of God’s Word as it relates to all church matters of this fellowship. All praise, honor and glory be to God and his Son, our savior, Jesus Christ. That the scriptures of the Old and New Testaments are the records of God's revelation of Himself in the work of redemption; that they were written by men under the special guidance of the Holy Spirit; that they are able to make men unto salvation, and that they constitute the authoritative standard by which religious teaching and human conduct are to be regulated and judged. II Timothy 3:15; II Peter 1:19-21. There is one God. The Father Almighty, maker of heaven and earth, and all things visible and invisible. Eternally existent in three persons. The Father, The Son, and The Holy Spirit, being co-equal. Nehemiah 9:6; Psalms 24:1-2; Ephesians 4:1-6; Philippians 2:6; Colossians 1:15-19; I John 5-7. The only means of being cleansed from sin is through repentance and faith in the precious blood of Christ, thereby being justified by grace, he that believeth hath the witness in himself. Luke 24:26-27; IJohn 2:3-7; Romans 3:23- 15 ; I John 5:10-13. Baptism in water is by immersion, is a direct commandment of our Lord, and is for believers only. The ordinance is a symbol to the Christian 's identification with Christ in His death: burial and resurrection. Matthew 28 :19; Acts 8:36-39; Romans 6:4; Colossians 2:12. The following recommendation regarding the water baptismal formula is adopted; to wit:on the confession of your faith in the Lord Jesus Christ, the Son of God, and by His authority, I baptize you in the name of the Father, the Son, and the Holy Ghost. "Amen"
The baptism in the Holy Ghost is a gift from God as promised by the Lord Jesus Christ to all believers who ask. Luke 11:13; John 7:37-39, 14:17-26: Acts 1:5-8; 11:16. That justification is an act of God whereby all the sins of past life are forgiven through faith in our Lord Jesus Christ, and comes immediately in connection with true repentance and includes regeneration or being born again. Romans 3:24-25; Romans 5:1-2. That sanctification is an act of grace whereby the believer is separated, dedicated and consecrated unto God; body, soul and spirit. A.	Instantaneous sanctification is an act wrought in connection with regeneration. St. John 17:17; Romans 6:22; 12:1; Hebrews 13:12-13. B. Progressive sanctification is the process in which the believer continues to grow in grace. II Corinthians 3:18; Hebrews 2:11, 12-14; I Peter 1:15-16; II Peter 3:8.
c.	Entire sanctification denotes a state of being wholly sanctified, body, soul and spirit. I Thessalonians 5:23; Hebrews 12:14, Jude 24. The redemptive work of Christ on the cross provides healing of the human body in answer to believing prayer. Matthew 8: 17; Mark 16:18; James: 14-16; I Peter 2: 24. Sunday, the first day of the week is a day of holy rest and worship in the ministry of the word. In the ultimate prevalence of the Kingdom of Christ over the earth; in the glorious appearing of the Great God and our Saviour Jesus Christ in the resurrection of the dead and in a final judgement, the issues of which are everlasting life and everlasting punishment. Matthew 13:49; Matthew 25:31-46; Acts 1:11, 17-31; Revelation 1:7.